Of all the games available to online casino players, online Poker is definitely a favorite in the hearts of many. The game’s combination of skill and luck appeals to a wide range of players. Our Gambling Planet guide to Online Poker will explore the rich history of the game, as well as the secrets behind its most popular variation: no-limit Texas Hold'em. Read through it, then take start playing at one of the Poker sites below. Have you grown tired of playing free Poker on Facebook or other sites that offer the game using free play money? If so, it’s about time you get on the bandwagon and start your real money Poker experience as soon as you can. 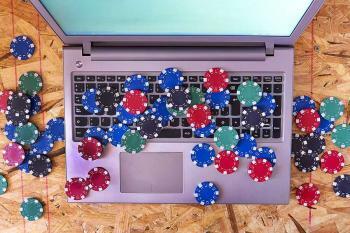 Many online Poker players have even carried their success into the professional ranks, both on the computer screens and on the real green felt at casinos around the world. The best players in the world are regularly featured on TV shows, books, and instructional DVDs. So how can a new player get into this game? By signing up online, of course. Each one of our online Poker reviews above delves into all you need to know about the sites, including where they’re licensed, the array of Poker games they offer and the online casino payment options available too. You’ll be able to find variations of low and high limit Poker games on the net. Over the years, Texas Hold’em Poker has earned its place as the world’s most cherished game of Poker that can typically be found at both land-based casinos and online Poker sites too. One of the most telling signs of why it’s so popular amongst casino goers is that the game has really simple rules when compared to other variants of the classic table game. Usually, the game of skill is available to play at the vast majority of live tournaments that take place at various land-based casinos in the world’s gambling meccas. You’ll also be able to play various tournaments in casinos online. 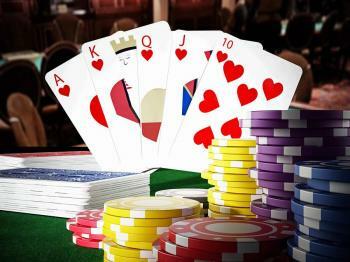 Generally speaking, Texas Hold’em Poker hands are always ranked in the same way with a 'Royal Flush' being the highest ranking hand and a 'One Pair' being the lowest ranking hand. As the old Poker saying goes, Texas Holdem takes a minute to learn, but a lifetime to master. Just like in Poker games at land-based casinos, an online game of Poker starts off when players take their seats. Before the dealer proceeds to deal out the cards, the player sitting to the left side of the dealer will put a small blind on the table. A big blind is also put on the table by the next player to the left of the gambler who first put out the small blind. Once the blinds have been placed on the table, the dealer will give out two cards to each player. Cards are dealt face down. Hence, only players will have the opportunity to check what they have and opponents don’t. When you’ve had the chance to peak at your cards, you and other players sitting at the table will need to place a bet or fold the hand. After every player has chosen what to do, the dealer will then deal out three more face-up cards in the middle of the table. This is known as the flop. Again, players can either choose to place a bet or wait for the next hand. The dealer will then place a fourth and fifth card on the table with a round of betting after each card. The player that makes the best five-card hand with any combination of his two cards and the five “community” cards, wins the pot. For a more detailed guide on how to play Poker, we recommend reading through our guide to Poker rules. In no-limit Texas Holdem, two factors are the key to ultimate success. The first factor is starting hand selection. Players who start with strong hands win much more often than those who hope to “get lucky” or bluff their way through the game even when they’re holding a weak hand. The other element is bet sizing. Players who bet aggressively can force their opponents into making bad decisions. The key to calculating odds in no-limit Texas Holdem is to know how many “outs” a player has. “Outs” are cards that will improve a player’s hand. For instance, if a player needs to fill an inside straight (4-5-X-7-8), he had four “outs”, since there are four sixes in the deck. Once a player knows how many outs he has, he can calculate his odds of filling his hand. With two cards to come, a player can multiply his outs by four to estimate his chances. For example, a player with five outs after the first three community cards has a 20 percent chance to complete his hand (5 x 4 = 20). With only one card to come, the player multiplies his outs by two. A player with six outs and one card to come has a 12 percent chance to make his hand (6 x 2 = 12). Now that you’ve read up on how to play Poker, it can easily be said that you probably feel more acquainted with the game. Yet, before you go ahead and dive into playing a game for real money, you should always keep in mind that online Poker will take you a while to master, especially since it’s a game of skill. And this is exactly why our experts at GamblingPlanet highly urge you to learn how to play the game using the free Poker game that’s available at our site as well as ones that are free to play at multiple other Poker sites on the web. Even when advances in software technology finally did make a reasonable replication of a live game possible, there wasn’t exactly a race to the virtual tables. Hardly anyone noticed on that fateful day in 1998 when Planet Poker became the first online Poker room of its kind, and it was almost six month before the site began attracting players. Online poker hadn’t yet experienced the explosion that was just around the corner, but the buzz was definitely building. Other sites, like PartyPoker.com, began entering the fray in 1999, and a few people on Wall Street and the London Stock Exchange began to take notice of the potentially booming industry. Meanwhile, many of the game’s early pioneers—guys like Greg Raymer and Chris Ferguson—continued to play a huge role in its development and were now beginning to reap the benefits. Much of the debate in the U.S. government about the future of online Poker stems from the issue of whether Poker constitutes a “game of skill.” Although a federal definition has yet to reveal whether Poker will fall under the general umbrella of “illegal online gambling,” many Poker rooms haven’t dared resume their operations. Some firms outside U.S. jurisdiction have ignored the UIGEA’s possible reprisals, reasoning that the American government would be hard-pressed to force this issue outside its national borders. However, court battles like Kentucky v. 141—which was spawned by brick-and-mortar partisans—have still managed to tie up operations for many international sites regardless. Overturning the UIGEA seems like one possible escape from the stalemate now in place, and there have already been several attempts to do so—one being the introduction of a new bill entitled the Internet Gambling Regulation and Enforcement Act (HR 2046). IGREA is seen as an effort to establish a comprehensive licensing and regulatory framework for online gambling in the United States. But the bill and others like it are currently languishing in congressional committees. Added to the legal debacle are recent publicity scares, such as the security breach at Absolute Poker in which an employee used his inside knowledge to view the hole cards of everyone sitting at his table! Clearly, this type of incident threatens the entire industry and has forced most of the major Poker rooms to up their security to the tee. Can you play online poker in the US? Many States in the United States don’t currently have online gambling laws which prohibit Poker players from playing the game. So it's pretty safe to say that online Poker can be played in the US. There are a few states however where online gambling is an offense. These include Washington, Utah, and Louisiana. Which are the states where online Poker is legal? Playing online Poker in the USA is completely legal in New Jersey, Delaware, and Nevada where it is heavily regulated. Each of these states has its own laws on which sites and how it can be played. Where will online Poker with real money be legalized next? Although we can’t really tell when real money Poker online will be legalized next, by looks of it the next States that will legalize the game will be States will California, Pennsylvania, and New York. Are online Poker sites safe to play at? Although not all online Poker sites are safe to play at, there are several that are. All the online Poker sites in the toplist on this page have been certain as safe to play at. They are all licensed and regulated by a reputable online gambling authority. How can I make deposits to real money Poker sites? There are several deposit options you can use to play real money Poker online. These include Mastercard, Visa, Maestro, EntroPay, and Paysafecard. How can I play poker online for real money? You’ll need to head to a licensed and regulated Poker site to play online Poker for real money. You’ll then need to open an online account and deposit your bankroll via one of the online casino payment methods to play. Once your money is available in your account, you’ll then be free to play the game online. Do casinos normally have online poker free games? Poker can be played on many different sites on the web for free. However, when it comes to playing online Poker at different casino sites on the web, you’ll find that not all sites will offer it. There are a few which do though and you’ll be able to play the game using free play money. Do online Poker real money sites offer games with low limits? Part of what makes playing Poker for real money great to play online is the fact that you’ll be able to find a variety of tables with both low and high limits. So you’ll be able to pick your table according to your bankroll. Can I play Poker online with real money on my mobile? Yes, you can play online Poker on your mobile should you wish to. In today’s age, many reputable Poker sites have downloadable apps which offer Poker for real money. So you can start playing and even possibly turning a profit whenever and where ever you are. Are there several types of online Poker games? Yes, there are several types of online Poker games to play online besides Texas Hold’Em. Among the lot are Omaha, 7-Card Stud, Razz, and 5-Card Draw. Will I be able to find quick online casino variants of poker to play? Yes, you’ll be able to find a few casino variants of Poker to play. These include Caribbean Stud Poker, Video Poker, and online Pai Gow Poker. All these online casino games are loosely based on Poker. Yet, they do have their differences, so be sure to read up on the rules pertaining to each of the games. While almost all forms of Poker challenge the mind, online Texas Holdem is by far the most played variation of online Poker that’s played by the lion’s share of players out there. Not only does the game test the nerves of its players, but it also allows gamblers to win huge sums of money when playing in live tournaments. At GamblingPlanet, we definitely recommend playing Poker or online Blackjack, if you prefer games of skill to ones of pure chance. 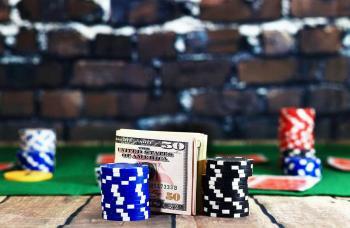 Players who are new to the game should try the “play money” tables and get accustomed to the speed and mechanics of Poker before trying to play the high-stakes games.